Nature’s Way is located in Northeast Knoxville on seven beautiful wooded acres bordered by farm land. The campus consists of three buildings, a large outdoor area that provides opportunity for varied educational and recreation activities, an extensive Nature Preserve which includes marked environmental points of interest, and wooded areas accessible to students for play. The school opened in 1982 with twenty preschool children and since then has has grown to serve approximately 160 students each year through the 8th grade. 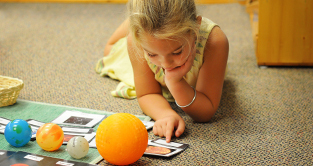 Each of our eight multiaged communities is guided by a Montessori certified lead guide. Our programs follow Dr. Maria Montessori’s educational philosophy and continuum through a carefully prepared environment, informed observation of the child’s social, emotional & cognitive growth, and work that is engaging, challenging, and satisfying to the child. Please spend some time familiarizing yourself with our programs and our mission as presented on this website. We hope you find our site helpful in learning more about Montessori Education and specifically about Nature’s Way. We would enjoy speaking with you about your child(ren) and your family’s educational goals. Come and visit! We would love to share our classrooms and grounds with you. Our Toddler Community serves the needs of the youngest members of our school, aged 2. These children then enter our Early Childhood Community, which is designed for children ages 3 -6 including kindergarten. We have two elementary communities. Lower Elementary is divided into two homerooms and is comprised of children in 1st – 3rd grades. Upper Elementary guides children in 4th – 6th grades. 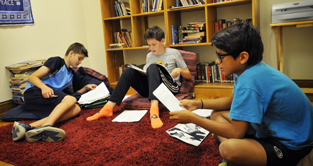 The Adolescent Community at Nature’s Way is ambitious and innovative. It responds to the developmental needs of 7th and 8th grade adolescents and concurrently provides a vision of scholarship and excellence.